Happy Wednesday! The Nerdy Book, Colby Sharp, and I are celebrating Here Comes Destructosaurus! I hope you enjoy jumping from blog to blog. I wrote the words in orange, and Jeremy wrote the words in black. Thank you, Jeremy! The illustrations for Here Comes Destructosaurus! were Very Difficult! Coming up with the unusual camera angles was hard enough without having to draw so much destruction. And keeping it all "kid friendly" was another challenge -- how to make so much mayhem cute! Aaron Reynolds and I are just these two guys, ya' know? I think we saw eye to eye where this story is concerned. Amelia May Mac designed a great picture book. I love that she found fonts that played into the art and story so well -- that the words and letters all look a little "off kilter", as though they have been shaken and bumped by, say, a giant monster. And her suggestions of how to change angles here and there were all spot-on as well. She helped me give the art a more cinematic appeal. If you ever visit Vancouver, Canada, you won't want to leave! It's so beautiful here surrounded by mountains, forests and the Pacific Ocean. I really can't do it justice here. And there are a LOT of good restaurants too -- especially if you like sushi. Yum! School libraries are the most undervalued part of the school. They offer kids a place where they can learn without realizing that they're learning. Where they can explore interests beyond what they can explore in the classroom. Where what they HAVE to learn can become what they WANT to learn (provided they have a great librarian). Reading is my absolute, favourite part of the day. It can fix a day when the kids and I have been misfiring, and it unwinds me at the end of a long day -- it's the best "me time." I plan to spend much of my retirement reading during business hours. Mr. Schu, you should have asked me what motivates me. That's easy: paninis! There's an amazing panini place at the top of my street and I'm allowed to eat there once a week IF I get my work done. I'm being a bit facetious. But only a bit, I DO like good panini. Seriously though, I don't think there is a more deserving audience than children. What a huge honour to make books for them! 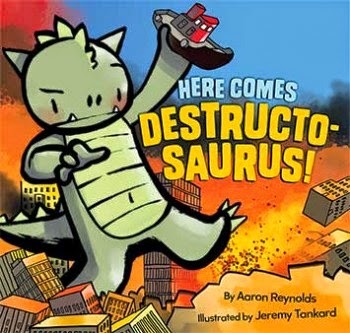 I am giving away one copy of Here Comes Destructosaurus! 1. It will run from 4/23 to 11:59 p.m. on 4/25. 7 Book-Related Things I’d Like to Destruct by author Aaron Reynolds. Click here to read Colby Sharp's interview with Aaron Reynolds. Borrow Here Comes Destructosaurus! from your school or public library. Whenever possible, please support independent bookshops. Great post! I agree that school libraries are way undervalued! I am lucky enough to be at a school where the PTA donates several hundred books per year, but they're all from the Scholastic book fair. It'd be nice to have some $ for purchases from other publishers as well. This looks like a great book! Aaron Reynolds visited us a couple weeks ago! What a dynamic presentation for our students! My son loves Destructosaurus! A Wonderful Morning with Andy Griffiths! What's on the hold shelf?